If someone has additional information or wants to modify the below text, please get in touch. There is plenty of space here to add more. St Peter's Church is dedicated to St. Peter ad Vincula (St Peter in chains). 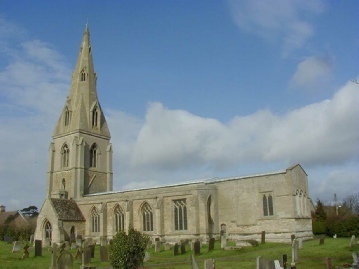 A Saxon church, mentioned in the Domesday Book, was located here but the Normans began rebuilding the church in 1170. 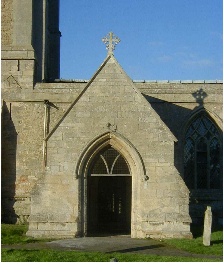 Part of the church, notably the door and porch, is dated to 1310. 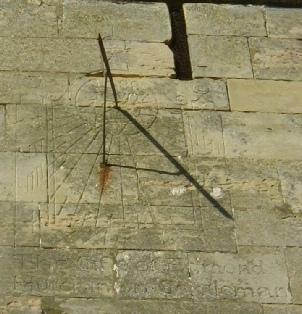 A sundial on the turret to the left of the porch says "1688 Gifte of Edmond Hutchinson, Gentleman". 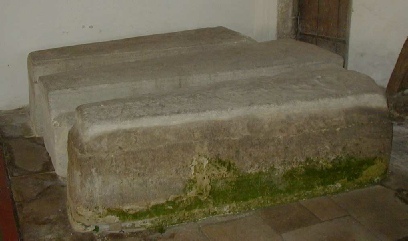 The church contains three 14th-century tombs, one of which is inscribed "Hic intumulatur Johannes quondam dominus de Trikingham". The church was struck by lightning for the 3rd time in July 1870. The spire was restored in 1872 and the church was thoroughly restored in 1880. St Peter is a Grade 1 listed building since February 1st 1967. 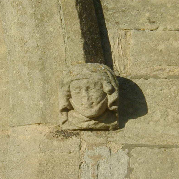 Built in 1310, the porch is adorned by a cross that was recovered from the apex of the Chancel. The porch played a significant part in our ancestors' religious acts and lives. The baptism service was started with the god parents vows. Banns, civil notices and legacies were handed out. Marriage ceremonies were started, and those who had broken vows were forced to stand in a white sheet. 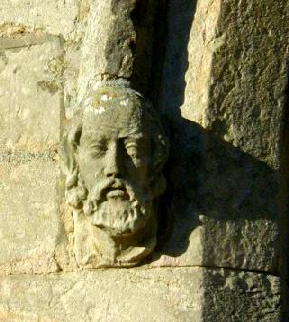 There are 2 heads on the outer drip-stone. To the left is St Peter, carved in 1856, and to the right a lady with veil and wimple, carved in about 1310. Just below the lady is a Mass clock dial. The hole for the metal rod called a gnomon is clearly visible, as are the lines showing the times for Mass. Below that are what appear to be footprints, but their purpose is not known. '1688 Gifte of Edmond Hutchinson, Gentleman'. 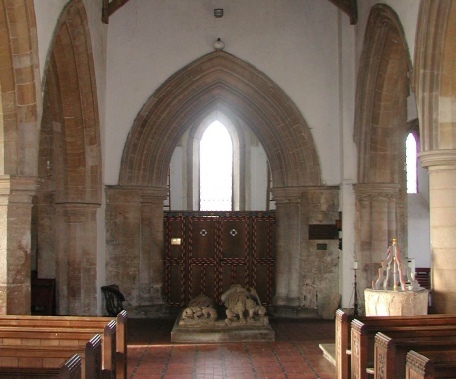 He lived in 1 of the village's 2 manor houses, and his grave cover of 1691 can be found in the Chancel floor. He married a member of the Quincey family from Sempringham. The Quinceys' graves and memorials are to be found throughout the church and graveyard. On the right of the entrance is the holy water stoup. 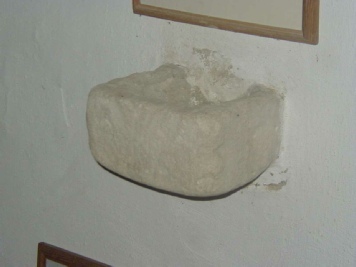 Placed in the Church during Queen Mary's reign, this was removed in about 1562 because it was a 'monument of superstition'. Mr W A Cragg found it in 1912, being used as a chickens water bowl in a cottage next to the church, and had it replaced in its present position. 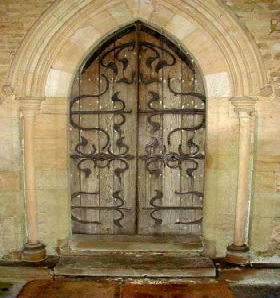 The main door is also from 1310 and is adorned with the original iron scroll- work. This scroll work would have been provided by the village 'Smith' who's patron saint was St Clement. By the 2 door rings can be seen the stylised letter 'C' which was symbolic of 'St Clement pray for us'. To the left of the entrance are three 14th century tombs. On the lid of one is inscribed 'Hic intumulatur Johannes quondam dominus de Trikingham'. 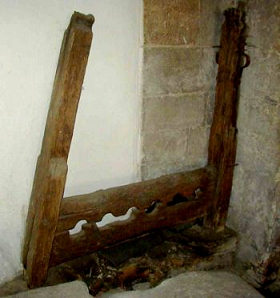 Behind these are the village stocks with wrist irons on the whipping post. 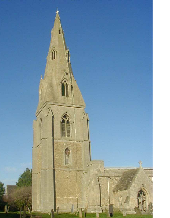 The tower is the first part of the Norman rebuild of the Saxon church (mentioned in the Domesday Book), that started in 1170. The outline of the narrow Norman roof is visible (more so on the external eastern wall of the tower). As you approach St Peter's you gain sight of what has been claimed to be the best ‘broached’ spire in England (a broached spire is one that rises from a tower without a parapet).